Every month this year I have been making a picture from flowers. It is both a record of the passing seasons and serves as a mandala to meditate upon. 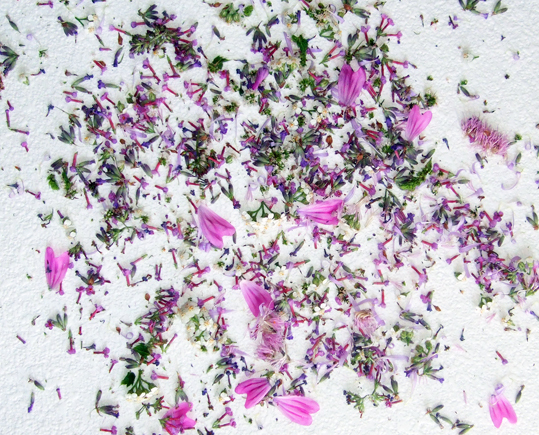 This month - July - I created one pretty much at random - scattering tiny petals from buddleia, lavender, mint, meadowsweet, enchanter's nightshade and mallow picked either from my own garden or the verges beside the roads near where I live. More than encouraging meditation, this month's mandala felt it was calling me to divine from the patterns, like tea leaf reading. After a while, I could see a heart-shaped face in the middle of the image. I'm not sure what it means, but it seems a good omen - perhaps the counterpoint to the sad face I created in my mandala for January. But, more than the picture itself, it was the smell of the flowers that was most inspiring for me. The cooling, soothing scent of lavender, mint and meadowsweet - among the other less-scented blooms - was perfect for a hot summer's afternoon. I spent more time lying on the sofa in the afternoon heat enjoying the perfume and wishing there was a way I could share that on my blog as well as a photo, than I did studying the mandala. I do recommend picking that combination yourself and letting the fragrance fill the room as you quietly meditate.